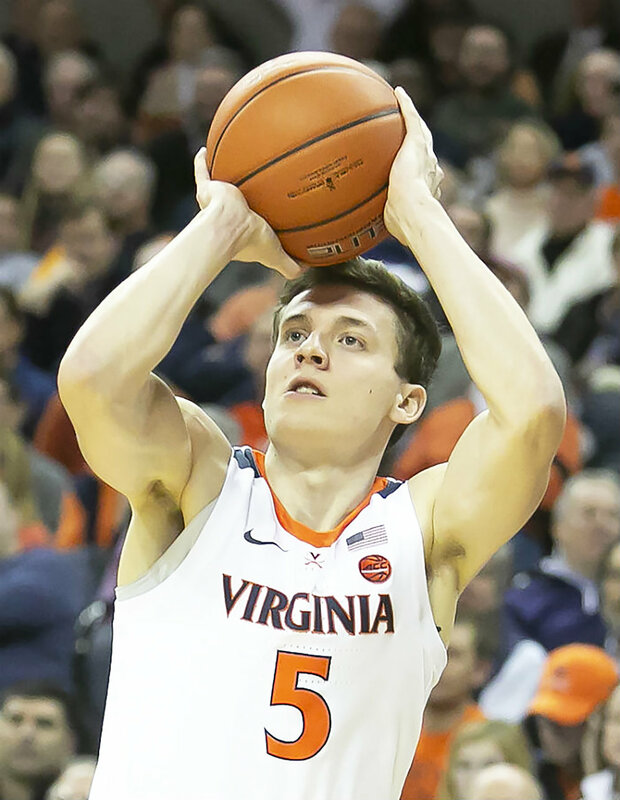 Junior guard Kyle Guy (pictured above) attempts a jump shot against the University of North Carolina on Feb. 11. Guy was named the Final Four’s most outstanding player on Monday April 8 (courtesy of Creative Commons). It was the lowest point in the history of the University of Virginia basketball, and it was a moment that would follow the players and coaches forever. Given the circumstances, many teams may have never bounced back, but the Virginia Cavaliers were not like most teams. One year after a historic worst, the Cavaliers battled back and were able to accomplish a historic first. The Virginia Cavaliers are the 2019 National Champions. On March 16, 2018, the University of Virginia Cavaliers suffered the most devastating loss in the history of the men’s basketball Division I NCAA tournament. Virginia fell to the University of Maryland-Baltimore County Retrievers by a score of 74-54. It was the first time a No. 1 seed had ever lost to a No. 16 seed and, to add insult to injury, it was a 20-point blowout. The players were obviously devastated, as most top seeds have dreams of cutting down the nets, but the Cavaliers were done after just one game. After a long offseason, Virginia began regular season play for this year’s season on Nov. 6, 2018. They defeated Towson University by a score of 73-42. The win kickstarted another fantastic regular season for the Cavaliers. The team went 29-6 and earned a No. 1 seed in the NCAA tournament yet again. This year Virginia faced the No. 16 seed Gardner-Webb University in the first round. Early on it looked as though tragedy might strike again for the Cavaliers as they trailed by as many as 14 points in the first half, but this year’s team did not panic and after a few scoring runs, they were able to secure a 71-56 victory in the round of 64. With the monkey finally off their back, Virginia was able to get comfortable and play their game as they made a run through the tournament. They secured wins against Oklahoma University, the University of Oregon and Purdue University on their way to the Final Four. Their victories were hard fought and the game against Purdue extended into overtime before Virginia could finally claim an 80-75 win. The Cavaliers took on Auburn University in the Final Four. The two teams played contradicting styles. Virginia played strong defensively and slowed down the pace while Auburn played at a breakneck pace and liked to light up the scoreboard. It made for an incredibly exciting game. With almost no time left on the clock, Virginia trailed by two. Junior guard Kyle Guy launched a three that missed, but to the dismay of many Auburn fans, a foul was called. With 0.6 seconds left on the clock, Guy had an opportunity to take three free throws and put his team up by one. He knocked down all three and, in dramatic fashion, Virginia advanced to the National Championship game. The Cavaliers would go on to defeat Texas Tech University to become the 2019 National Champions. The 85-77 victory, like many of the others, did not come easy. Sophomore guard De’Andre Hunter hit a game-tying three with only seconds remaining to send the game into overtime. Virginia took care of business from there and were able to come full circle after hitting rock bottom in last year’s tournament. The joy and relief on the faces of the Virginia players and coaches was obvious as they secured the first national championship in program history. While the team will always be remembered for their historic loss, they will also now be the team remembered for bouncing back and winning it all the following season. It is because of this adversity that Virginia was the team most deserving of the title. They fought through incredible adversity and despite being down in many of their tournament games, they refused to quit. Virginia rewrote their own narrative and are a perfect example of why sports are so great.